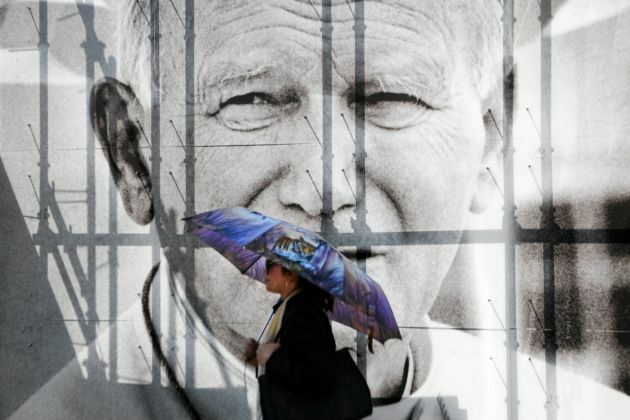 (Photo: REUTERS / Jakub Ociepa / Agencja Gazeta)A woman with umbrella walks past an image of late Pope John Paul II, part of a decoration preparation, at Old Town Market in Krakow, southern Poland April 23, 2011. Polish Pope John Paul II was beatified on May 1, 2011 in Rome. Two of the most influential Catholic leaders during the 20th century, Pope John Paul II and Pope John XXIII, will be declared saints in April next year, Pope Francis announced Monday. This follows the Pope's announcement in July that he would canonise his two predecessors. The canonisation of two former pope's at the same time will be a first in the history of the church. And the expected presence of two successive popes, Francis and Pope Emeritus Benedict XVI will also be a first. Pope Francis made his decision after accepting a second miracle attributed to John Paul, who was pope from 1958-1963, and who called the Second Vatican Council that introduced massive changes for the Catholic Church. Polish John Paul, the first non-Italian pope for more than 400 years was pontiff from 1978-2005. 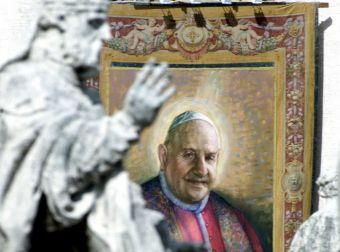 (Photo: Reuters)A tapestry with the image of Pope John XXIII (1881-1963) hangs on the facade of St. Peter's facade during a beatification ceremony [celebrated by Pope John Paul II] September 3, 2000. [Pope John Paul put two of his predecessors and three other people who lived in the 18th, 19th and 20th centuries on the road to Roman Catholic sainthood at a solemn ceremony before some 100,000 people in St. Peter's Square. The BBC reported that the decision to canonise the two at the same time seems intended to unify Catholics. "John XXIII is generally a hero to the church's progressive wing while John Paul II is typically lionized by Catholic conservatives," Agence France-Presse quoted John Allen, from the National Catholic Reporter, a US weekly saying. Allen said the decision could be interpreted as "a statement that any attempt to set them at odds is artificial, and that what they had in common is more fundamental than any perceived differences". Conservative Catholics admired John Paul II, who was also a media-friendly pontiff who connected to the faithful on his frequent travels around the globe. More progressive Catholics view John XXIII as a favorite for trying to bring the church and its liturgy to the people. At John Paul's funeral crowds in St Peter's Square chanted "santo subito" ("sainthood now" and the Vatican has fast-tracked his path to canonization.